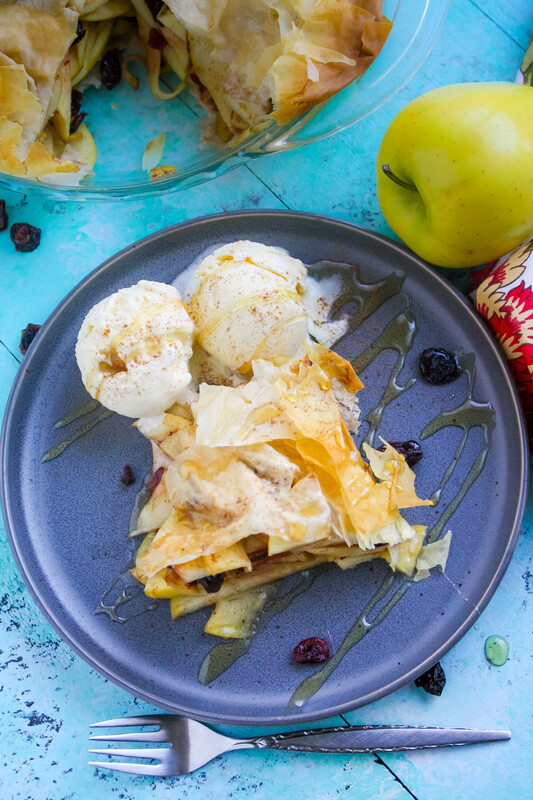 This Apple-Cranberry Tart in Phyllo is the perfect treat to transition from summer to fall. As much as I love the fall and as much as I want the summer temps in Phoenix to come down already, I hate saying goodbye to summer! This tart isn’t like a heavy-duty pie, and it’s not overly sweet, either. 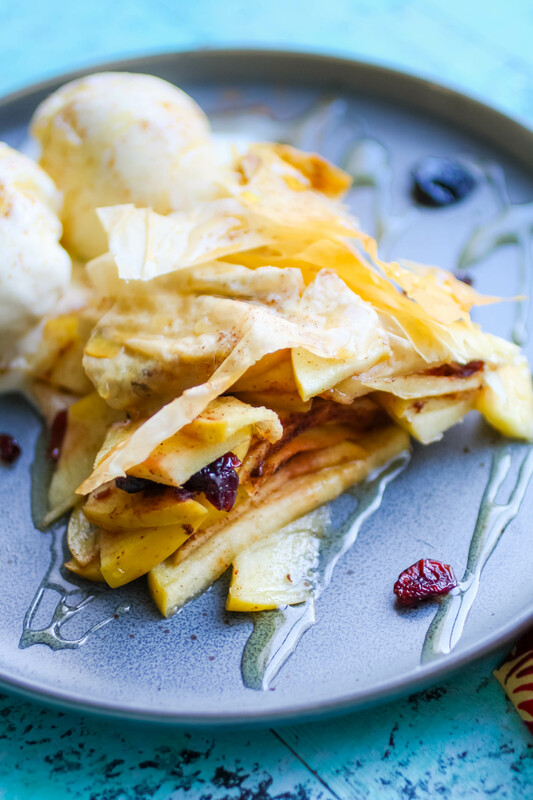 You’ll love the flaky phyllo pastry that drapes over the warm apples and dried cranberries. I served this with vanilla ice cream because I have a hard time eating apple pie (or tarts) without it! Crostatas are fun to make, too, for something a little different. This recipe for Apple Crostata with Oat Crumble Topping includes a recipe for my dad’s pie dough, which I love! I didn’t come up with this particular tart recipe. It’s from a wonderful National Geographic Kids cookbook I was sent called Food Fight! 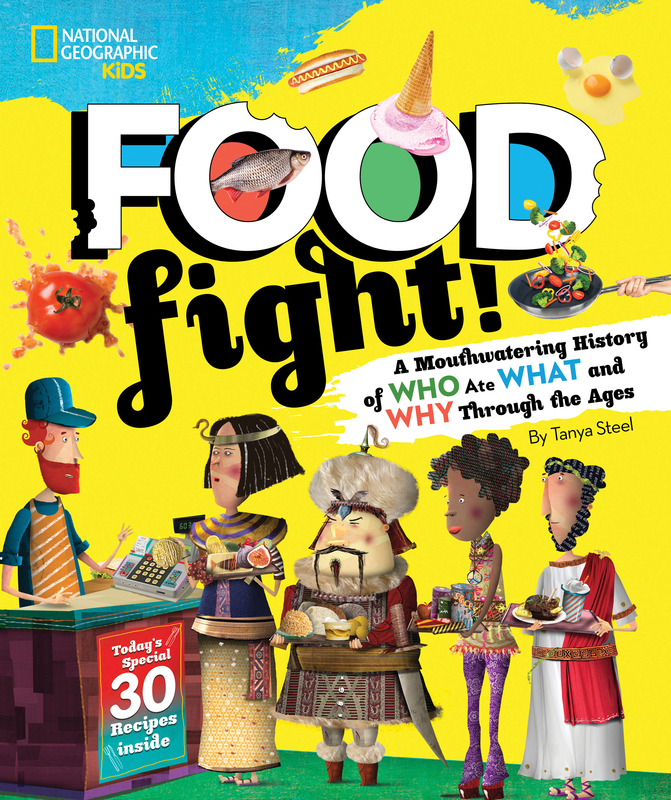 : A Mouthwatering History of Who Ate What and Why Through the Ages, by Tanya Steele. I’ve got to admit that I was fascinated with this book! The cookbook takes readers on a fun and flavorful trip through history. Each chapter covers a major period of world history (starting with the Prehistoric era through today) and gives examples of the politics, culture, class differences, and economics of the day. Flipping through the pages you’ll find an explanation of cooking tools used at the time, photos, illustrations, statistics, and even fun quizzes. I loved the creative titles for each recipe, too. This tart recipe is officially titled, The Apple of Shakespeare’s Eye in the cookbook, and was based on the recipe, A Quarter Tart of Pippins, from A New Booke of Cookerie by John Murrell from 1615. Your kids might like to help whip up dishes like Roast Mastodon on a Stick (made using beef), The Earl of Sandwich Sandwich, Allied Soldier Pudding, or Astronaut Fruitcake. Everyone is back to school by now, and this cookbook is a great way to make learning history fun. Not to mention, it’s a great way to get kids interested in cooking! Check out a copy of the cookbook for yourself or for someone you think will love it! For a treat that’s easy to make and perfect between the seasons, toss together this Apple-Cranberry Tart in Phyllo. It’s a delight! Preheat the oven to 375 degrees F. Use the cold butter to coat a 9-inch pie dish and set aside. 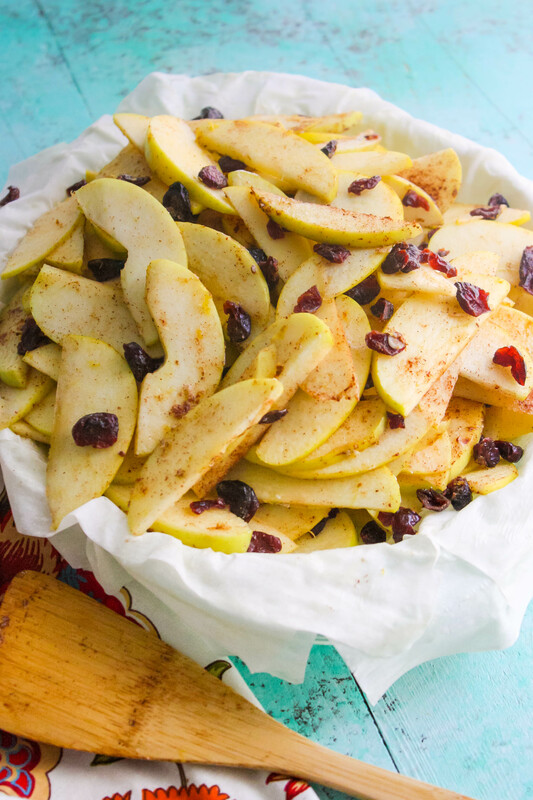 Add the apples, 2 tablespoons melted butter, cinnamon, ginger, honey, cranberries, and lemon zest to a large bowl, and toss to combine. Set aside. Divide the phyllo sheets and use 1/4 of the sheets to line the bottom of the pie dish. Arrange the sheets in the shape of an X, placing one sheet over the other. Brush some of the melted butter over the phyllo . Use another 1/4 of the sheets as another layer, again placing one over the other in the shape of an X. Brush with some of the melted butter, then add the apple mixture over the sheets. Use the remaining phyllo sheets to place over the apple mixture, the same way you did on the bottom of the dish. Tuck and fold the overlapping sheets over to form an outer crust. Brush the remaining butter over the top. Bake for 35-45 minutes or until the top of the phyllo is golden. Remove from the oven and allow the tart to cool for 15-20 minute before slicing. Drizzle a bit of honey over the top and serve with vanilla ice cream or frozen yogurt if you’d like. This sounds so yummy! I love everything about it so I'm sure it's the perfect combination! 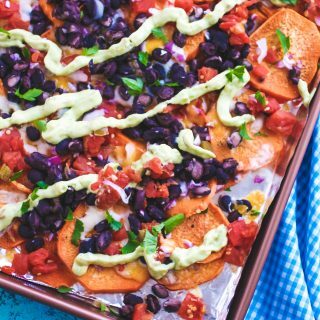 This recipe is absolutely drool-worthy. And I must congratulate on your photography skill. Each pic looks vibrant and mouth-watering. Thanks for the book recommendation. The subject sounds fascinating. Will check out for myself. I love using phyllo! It's so flaky and perfect! This look so yummy! This sounds right up my alley - I'm looking for desserts that aren't too sweet! Besides, the sugars from the apple and cranberry are enough. :) I'll have to check this book out! I have never seen one of your recipes that did not look totally delicious! Can't wait to try this one! I've never thought about using Phyllo Dough for this! This sounds so delicious! OMG, you had me apples! I can't wait to try this :) love your writing BTW! This looks so yummy! Perfect recipe for fall! This tart looks so delicious. The combo of apple and cranberry is a great combo. I love phyllo douogh and creating recipes with it, this recipe looks delicious. 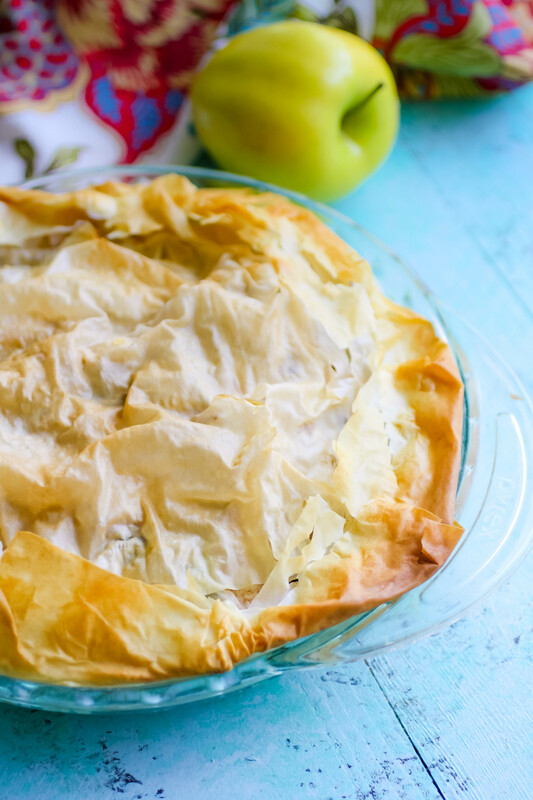 I never would have thought of making a pie in phyllo! Look so flaky and delicious. My kids and I love national geographic books of all kinds!!! This book and especially this recipe look great!! Love the look of this dessert. Phyllo pastry is so much fun to work with. The combination of apples and cranberries is perfect for fall. 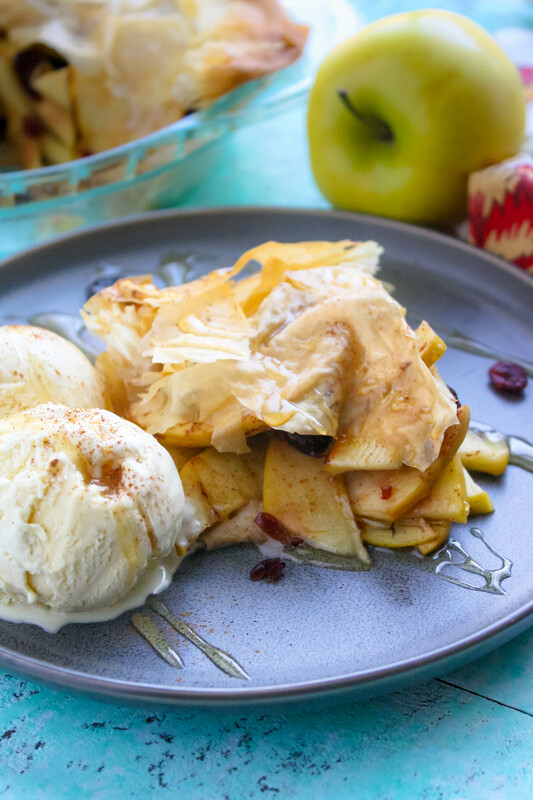 Warm spices, apples, ice cream - I call it perfect balanced dessert. I think my kids will enjoy these. I love apples and cranberries together the tartness and sweet are a perfect combination of flavor and wow in that crust over the top! What a great idea! Sometimes I don't love piecrust- mine usually turns out too dense. THis looks fabulous! Oh, this looks so good. A few weeks ago I made apple tart in phyllo pastry so I can almost virtually taste and smell this. Love the flaky phyllo on top. That book sounds so interesting. Must keep an eye for it. The tart looks delicious! Rustic desserts are my favorites. And I'm a lover of Fall. I simply enjoy the brisk temperature in the morning, the warmth of the afternoon, and the coolness of the evening. And the cool evenings gets me thinking of Fall desserts like this one. I'm pinning -- I imagine it would work well with pears too. I love that this tart is done in phyllo dough because it makes everything flaky int he best way! I've never done cranberries with apples together in a tart so far, but I love those two flavors together in other dishes so I'm sure this tart would be a hit at my house! I love apple pies, this tart reminds me of a pie but with a lighter, thinner crust. This is a perfect dessert for fall. This apple cranberry tart looks delicious, I like the name of recipes you mentioned in that food fight cookbook. I will check out. I would like to make some for my kids. I looove phyllo filled with fruits. It's super easy dessert that is both delicious and easy to make. I absolutely love how yours turned out. It looks so crispy and so flavorful.